Chilling evidence surrounding the barbarity of the Khmer Rouge leadership continues to mount at the Extraordinary Chambers for the Courts in Cambodia where three of Pol Pot’s senior henchmen – Nuon Chea, Khieu Samphan, and Ieng Sary — are back before a bench of local and international judges. This time the evidence was delivered by 61-year-old Em Ouen who worked as a medic during 1977 and 1978 and testified he had seen live humans being used for medical experiments, instead of corpses, while in Sector 20, a Khmer Rouge provincial base at Prey Veng southeast of Phnom Penh. His testimony earned the Khmer Rouge, who reigned over Cambodia from 1975 to 1979, comparisons with Nazi Germany and the Holocaust or Japanese medical experiments carried out on Chinese prisoners during World War II, among long-time observers and in the local media. Em Oeun’s father was a doctor and he had learned enough about medicine while growing-up to make himself useful to local Khmer Rouge, which sent him to work in a hospital and then onto Phnom Penh where he was taught some medical basics. In the capital, medicine was in short supply and had been scavenged from deserted pharmacies after the city was evacuated by the ultra-Maoists with the population forced into labor camps in the country-side where Pol Pot claimed he was building an agrarian utopia. As such most of the patients in the city were officials, and those who curried favor with the leadership. Back in Prey Veng a different story had evolved. It was here that people labeled as spies, enemies of state, or had close ties to the previous regime had been taken after being sentenced to death. But unlike the Killing Field- where people were killed en-masse usually with an ox-cart axel to the nape of the neck- these people were cut open alive under the macabre guise of medical experiments designed to teach young Khmer Rouge medicine. His testimony was not a total surprise. 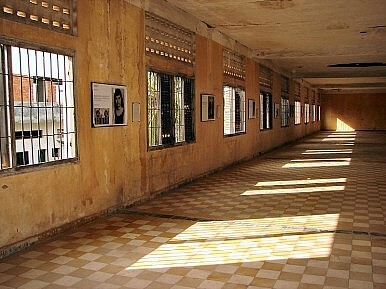 During the first Khmer Rouge tribunal of Kang Guek Eav, also known as Duch, the court heard how prisoners at the S21 torture and extermination camp had been kept alive just enough to provide blood for transfusions needed for wounded soldiers on the battlefield. Torture at S21 — including electrocution, water boarding, starvation and long periods of being shackled in order to obtain a forced confession — had become synonymous with the trial. Duch was jailed for life on appeal after being found guilty of crimes against humanity and the deaths of at least 12,000 people at S21. The actual S21 death toll has been estimated to be much higher, probably around 24,000 people.